UPDATED AUG 18th 2013: IRISH FANS!!!! VIVA! HYSTERIA is coming to Cineworld Cinema, Parnell Street on September 19th for one showing only. Tickets are on sale now priced €10.50 from their Official Website. 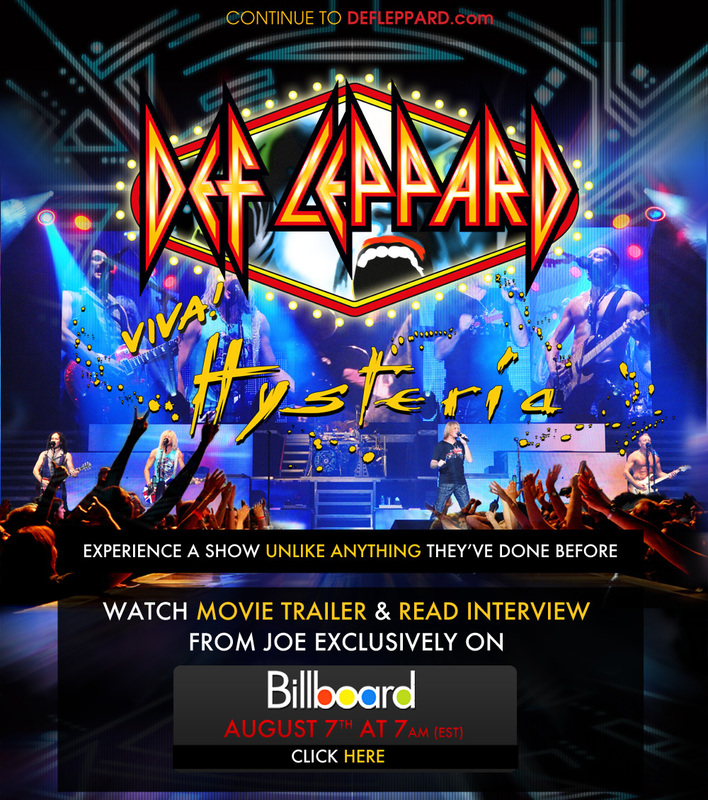 Bad news for Irish fans – there won’t be a cinema release for Def Leppard’s new live show film – Viva Hysteria. Even though they recorded Hysteria here (guilt), even though they lived, worked and loved it here (guilt, guilt) and even though Joe Elliott lives a stone’s throw away from where I’m sitting (guilt x3) – the band, who stored their equipment in Dublin, recorded their most recent albums in Dublin, practice before tours in Dublin and have brought almost every major tour they’ve ever played here – they won’t be releasing it in Irish cinemas. Well Holy Elliott, I never thought I’d see such a thing. Even just a few days after I posted a loving tribute to you – you’ve gone and assumed Irish fans won’t be interested in sitting through your performance. Well that’s fine, I’m ok. I’m just disappointed that unlike Metallica, unlike Slayer, Megadeth and Anthrax, unlike One Direction, The Jonas Brothers and Katy Perry – Leppard are the ones I can’t go and see locally. DVD /Blu-Ray are out October 21st in Europe. 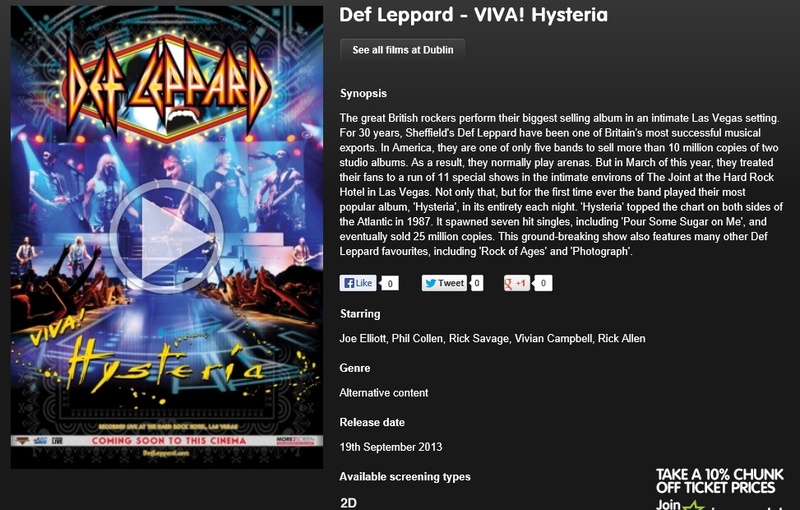 For anyone outside of Ireland visit Defleppard.com for more details about local cinema screenings and so on. …I still love you Leppard, but you have let me down. Well maybe it’s Dublin’s fault that Leppard are not releasing Viva Hysteria here… So let’s remind Leppard of our history together. According to DefLeppardUK, the band have played in Ireland a total of 14 times (Tickets There has managed to catch six of those shows) since their first gig on these shores in 1983. They moved to Ireland in the mid-80’s when recording Hysteria and lived just outside the city centre in a little house pictured on your left. Their local was a lovely bar called The Old Punch Bowl (‘actual real authentic legit’ group photo outside the pub can be seen above) Remember lads – remember the good times. while here, they worked on their classic album – Hysteria. 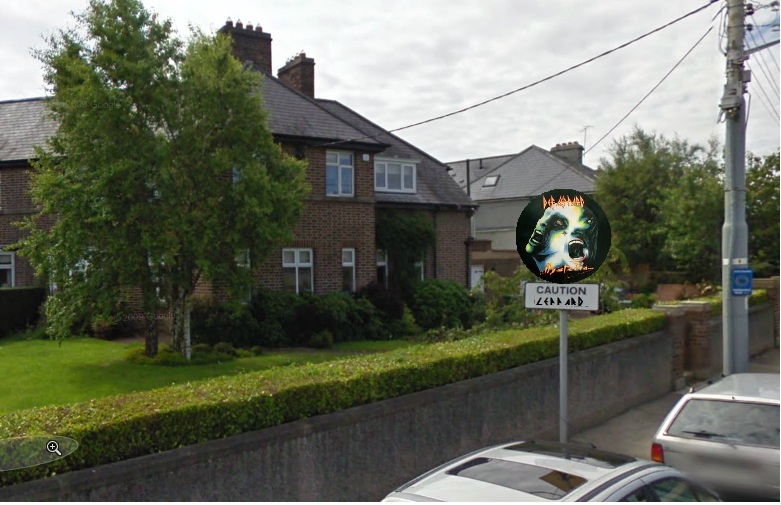 Leppard loved it so much in Ireland, they decided to store their gear here and some of them even bought houses. The suspected venue where that gear was stored can be ever so slightly seen on the right. I’m not giving out details because they might still be keeping things here and I know you lot go mental for stalking. All those times I be blogging stuff and ye go mental – well no more! From now on I’ll drip feed the lot of ye. After a few of the lads moved away (unconfirmed), it was mighty Lepp frontman, Joe Eliott, who kept the DEF torch burning this side of the UK. He has lived in Ireland since the 80’s and darn well loves it here. 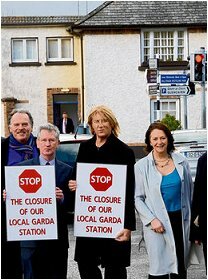 In fact, he likes it so much he even wanted the Gards to continue policing the area he lives in (again, picture) when they announced the station closures. Well that’s it for now. 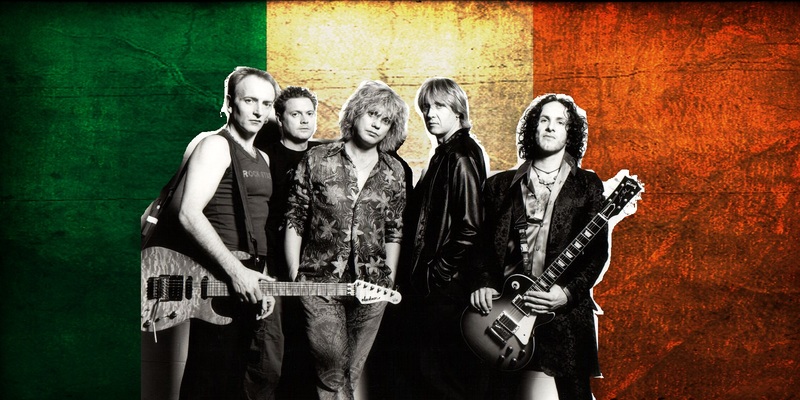 Maybe I’ll do a real article some day, but that should be enough to help get public interest started on the 100% official genuine Def Leppard walking tour of Dublin. I leave you with a then and now shot of The Point Depot / The O2. The then photo features Leppard in the 80’s just sitting around – proper Rock (and I feel like some gimp-Perez Hilton type who needs a shower to wash off the words). This entry was posted on August 7, 2013 at 5:50 pm and is filed under Music, News with tags cinema, Def Leppard, dvd, Viva Hysteria. You can follow any responses to this entry through the RSS 2.0 feed. You can leave a response, or trackback from your own site.